Auroral experiments make glowing plasma patch. An experiment that fires powerful radio waves into the sky has created a patch of 'artificial ionosphere', mimicking the uppermost portion of Earth's atmosphere. The research has not only caused glowing dots to appear around these patches — it could also provide a new way to bounce radio signals around the globe. The High Frequency Active Auroral Research Program (HAARP), near Gakona, Alaska, has spent nearly two decades using radio waves to probe Earth's magnetic field and ionosphere. 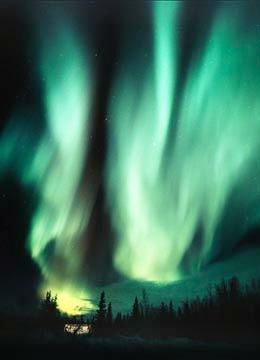 One of the most obvious results of the experiments is that they can create lights in the sky that are similar to auroras, the glowing curtains of light that naturally appear in the polar skies when electrons and other charged particles pour down from Earth's protective magnetosphere into the upper atmosphere. There, at an altitude of about 250 kilometres, the charged particles collide with molecules of oxygen and nitrogen and make them emit light, similar to the process inside a fluorescent light bulb. HAARP's high-frequency radio waves can accelerate electrons in the atmosphere, increasing the energy of their collisions and creating a glow. The technique has previously triggered speckles of light while running at a power of almost 1 megawatt1. But since the facility ramped up to 3.6 megawatts — roughly three times more than a typical broadcast radio transmitter — it has created full-scale artificial auroras that are visible to the naked eye. But in February last year, HAARP managed to induce a strange bullseye pattern in the night sky. Instead of the expected fuzzy, doughnut-shaped blob, surprising irregular luminescent bands radiated out from the centre of the bullseye, says Todd Pedersen, a research physicist at the US Air Force Research Laboratory in Massachusetts, who leads the team that ran the experiment at HAARP. The team modelled how the energy sent skywards from the HAARP antenna array would trigger these odd shapes. They determined that the areas of the bullseye with strange light patterns were in regions of denser, partially ionized gas in the atmosphere, as measured by ground-based high-frequency radar used to track the ionosphere2. The scientists believe that these dense patches of plasma could be gas that was ionized by the HAARP emissions. "This is the really exciting part — we've made a little artificial piece of ionosphere," Pedersen says. "The novelty is not seeing the aurora — it's the fact that we can actually create enough high-energy electrons to form plasma," says Mike Kosch, chair of Experimental Space Science at Lancaster University, UK, and a former co-worker of Pedersen's who was not involved in the experiment. "It shows something completely different and new that we hadn't expected. We didn't know we could do that from a radio array on the ground." The team's results are published in Geophysical Research Letters (http://www.nature.com/news/2009/091002/full/news.2009.975.html#B2). HAARP's success is down to the fact that it operates at much higher power than any other array running similar experiments, such as the EISCAT (European Incoherent Scatter) Scientific Association's antenna in Norway, which runs at 1.2 megawatts, explains Kosch. "Whether it's useful or not is another story," he adds, joking that companies might one day hire physicists to use the technology to write glowing advertisements in the night sky. But the costs would be astronomical to create artificial aurora that are visible, he says — the energy costs of running HAARP at full power are more than US$4,000 an hour. More serious applications might include creating a layer of artificial plasma that could reflect communications from a submarine, for example. The US Air Force, which co-funds HAARP with the British Air Force and others, could use the plasma to reflect radio transmissions, bouncing them farther around the globe without losing power, suggests Pederson. "Instead of depending entirely on the natural ionosphere to redirect radio waves or short-wave broadcasts," Pedersen says, "we are now getting the capability that we can actually produce our own little ionosphere". The results of the February 2008 experiment "make these concepts seem possible". Pedersen T. R. & Gerken E. A. Nature 433, 498-500 (2005). Pedersen T. et al. Geophys. Res. Lett. 36, L18107 (2009). © 2009 Nature Publishing Group, a division of Macmillan Publishers Limited. All Rights Reserved.